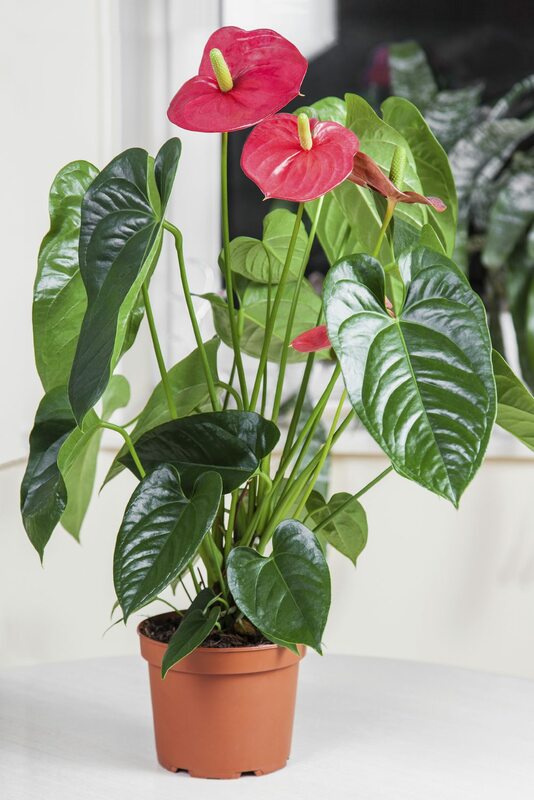 Anthurium, also known as flamingo flower, is a popular houseplant because it is generally easy to care for and because of its showy, heart-shaped flowers. This is a great plant even for inexperienced gardeners. Maintenance is low, although dividing anthuriums is sometimes necessary to keep them blooming. Anthurium is truly a tropical flower, so most of us have to be content with growing them indoors in containers. As a tropical jungle plant, anthurium thrives best in moist, warm conditions with indirect sunlight. Even without ideal conditions, this plant is tough and a survivor. It’s a great choice for someone who lacks a green thumb. On the other hand, some maintenance is required, including splitting anthurium plants, to keep them happy and healthy. One good reason for dividing anthuriums is simply that your plant is thriving and has outgrown its container. You can repot it or you can divide it and have two new plants. 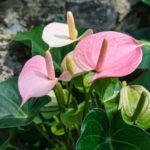 Your anthurium needs to be either repotted or divided when you start to see roots coming out of the pot’s drainage holes or circling the plant at the top of the soil. 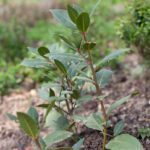 If the foliage is wilting or water goes straight through the pot, these are also signs that your plant has outgrown its container. When you have repotted your anthurium into several bigger containers, it’s time to divide it into smaller plants. The good news is that anthurium plant division isn’t difficult. You’ll be glad you did it if your plant is getting very large. Dividing it into more reasonable sizes will keep all plants healthier and will promote more flowering. Simply take the plant out of the pot and separate some of the roots. Look for the offshoots, roots that are easy to separate. Remove these and replant in a new pot. Depending on how large your anthurium is, you could divide it in two or end up with ten new plants. This is a great opportunity to use your anthurium divisions as gifts. If you don’t need ten potted anthuriums, pass them out to friends or use them as hostess gifts. Anyone would be happy to receive one of these gorgeous and easy-to-grow tropical flowers.